Hi, I wonder if you can help, I am getting so much different info and advice as to what to do. I have had my female rabbit about 3 weeks, she gets a bit nervous to be picked up and jumps away but is happy to be stroked, and takes food from my hand etc., and when held is quite happy. The lady I got her from said she couldn't keep her anymore, anyway I think maybe Saturday or Sunday just gone she had 4 babies, I say around this time as somebody told me they looked about 3 days old on Tuesday. Also I have a neutered boy who she was in with so I know it wasn't him, think she may have just been caught before I got her. As soon as i saw the kits I took her and her babies and transferred them to a smaller cage (my boy is too big for a smaller cage), and she has been fine. I always rub my hands over her to get her scent on me. My problem.... I am told do not pick them up at all, otherwise she will eat them or kill them and this has made me paranoid not to check them too much in case it happens, I would never forgive myself, but need to check they are feeding okay. One of them does seem smaller and not as rounded and not as alert. Their nest seems quite deep so I am wondering if they can reach her okay. Probably sounds silly but this is my first time with this. They are in the concealed area of the cage so don't have a separate nest box to take out. Can I take them out to have a look? When I check them over I give her greens or something tasty and she quite happily watches me check them and doesn't seem fussed, even debated getting an indoor cage so I can keep them all in to check on them. So many questions, when can you start to handle them properly? If I can take them out do I do one at a time, the thinner one... do i put it on her to feed or just put it back and see what happens? I just don't want to be doing the wrong thing. I dread every morning checking them in case she has eaten them or they're dead because I've disturbed her too much, I've had vets and RSPCA people tell me do not disturb leave her to it. Really don't know what to do. Many thanks. Might be your first litter, Nancy, but you're handling it like a pro. Let's answer those questions and erase all the guilt trips and anxiety because in your case it is not necessary. You transferred the doe and her kits to a new cage, and you're still worried she'll do them harm? No, I think your doe already knows you and trusts you. Good job, btw, for moving them. 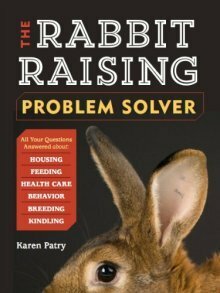 If you've read www.raising-rabbits.com/breeding-rabbits.html, you know we recommend that rabbit breeders check the nest and the kits over within a day or two of kindling. This involves doing just as you describe - distract the doe with a treat, pull the nest box out of the cage, and check away. We move the fur aside, pull every single kit out of the burrow, check the burrow for any dead kits or placentas, note that their bellies are all round, and then put everything back the way we found it. Our does could care less. Their mothering instincts are strong, and they know us well. Is your doe a smallish rabbit? If so, there is a chance that little thin kit might be a lethal peanut - a double dwarf that will certainly die soon, no matter what. On the other hand, perhaps it's just runty, and could just use a couple extra chances at the milk bar. With just 4 kits, I would think that it will get sufficient chance to fatten up without extra help, but if you think it is necessary, you can pull out the mum and give him an extra session on her belly each day until he gets stronger. Good luck, and enjoy your bunnies! Hi thank you so much for your feedback,and for your kind words, I do feel quite proud actually that they have all survived and what a good mum she has been. They are now nearly 9 weeks, one of them has gone to a close friend and I know will be loved very much. We are keeping one of them and need to find a home for the other 2, well maybe one lol as the one I was referring to before being smaller is still quite little and not as alert as the others. He eats and drinks 'ok' i would say, I have had to take him out away from the others, as they are more robust and stronger and he wasn't getting very much food and water. They seemed to be pushing him out of the way. I couldn't rest knowing he was out there so he is indoors with us, where I can keep a close eye on him, he does go out when it is a lovely day just for a bit of fresh air. He is supposed to be going to my nephew, but some days I do wonder if he is going to live. A lot of the time I find him laying down and sleeping and quite lifeless and it would be irresponsible of me to let him go knowing he is not 100%. Maybe he is ok but when I compare him to the others he is not the same, they are very lively and alert. Yeah, something is not quite right with the little guy. Re-homing is no problem, as long as your nephew knows exactly the situation. My first impression with the biting was that the bunny was hungry. Tiny kits pop up out of their nest and literally bite when they look for the dam's teats (no wonder they sometimes get sore!). I've gotten my fingertips nipped more than once, lol. Very curious, let us know how he does, okay?